The initial treatment for a patellar problem begins by decreasing the inflammation in the knee. Chiropractic treatment can help in the early stages by decreasing pain and inflammation. We may use ice massage, electrical muscle stimulation, patellar mobilization maneuvers and ultrasound to limit pain and swelling. A good chiropractic doctor will examine the entire kinetic chain, that is, look at your feet, knees, hips, pelvis and lower back. Small muscle imbalances, poor posture, faulty running biomechanics, joint restrictions at the knee and hip can all contribute to patellofemoral problems. If these are not corrected, the problem will keep returning. Chiropractic adjustments/manipulations are performed to help restore normal biomechanics to these areas. This is where chiropractic manipulation has an advantage over other specialties. Bracing or taping the patella can help you to do exercises and activities with less pain. Most braces for patellofemoral problems are made of soft fabric, such as cloth or neoprene. You slide them onto your knee like a sleeve. A small buttress pads the side of the patella to keep it lined up within the groove of the femur. An alternative to bracing is to tape the patella in place. The chiropractor applies and adjusts the tape over the knee to help realign the patella. The idea is that by bracing or taping the knee, the patella placed in better alignment within the femoral groove. This in turn is thought to improve the pull of the quadriceps muscle so that the patella stays lined up in the groove. Patients report less pain and improved function with these forms of treatment. As the pain and inflammation become controlled, your chiropractic doctor will work with you to improve flexibility, strength, and muscle balance in the knee. Patients with patellofemoral problems may benefit from four to six weeks of chiropractic care. The aim of treatment is to calm pain and inflammation, to correct muscle imbalances, and to improve function of the patella. Muscle imbalances are commonly treated with stretching and strengthening exercises. Flexibility exercises are often designed for the thigh and calf muscles. Guided exercises are used to maximize control and strength of the quadriceps muscles. Your chiropractor may issue a knee brace or instruct you how to apply tape to your knee. We may also cast your foot for special shoe inserts, called orthotics, to improve knee alignment and function of the patella. This will help reduce some of the excessive forces being transmitted to the knee and knee cap (patella). The patella is the moveable bone (kneecap) on the front of the knee. This unique bone is wrapped inside a tendon that connects the large muscles on the front of the thigh, the quadriceps muscles, to the lower leg bone. The large quadriceps tendon when combined with the patella is called the quadriceps mechanism. Though we think of it as a single device, the quadriceps mechanism has two separate tendons--the quadriceps tendon on top of the patella and the patellar tendon below the patella. Tightening up the quadriceps muscles places a pull on the tendons on the quadriceps mechanism. This action causes the knee to straighten. 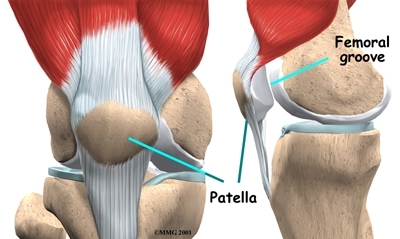 The patella acts like a fulcrum to increase the force of the quadriceps muscles. Two muscles of the thigh--the vastus medialis obliquus (VMO) and the vastus lateralis (VL)--attach to the patella and help control its position in the femoral groove as the leg straightens. The VMO runs along the inside of the thigh, and the VL lies along the outside of the thigh. If the timing between these two muscles is off, the patella may be pulled off track. 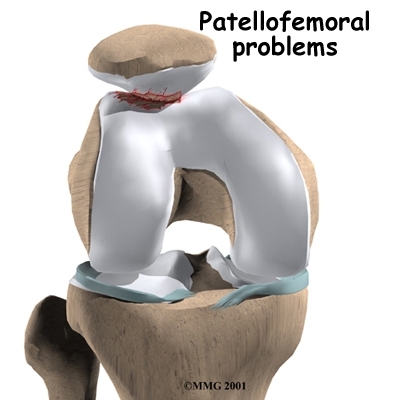 Problems commonly develop when the patella suffers wear and tear. The underlying cartilage begins to degenerate, a condition sometimes referred to as chondromalacia patella. Wear and tear can develop for several reasons. Degeneration may develop as part of the aging process--like putting a lot of miles on a car. 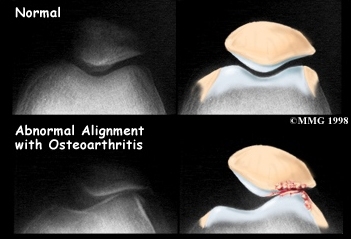 The patellofemoral joint is usually affected as part of osteoarthritis of the knee. A similar problem can happen when the timing of the quadriceps muscles is off. There are four muscles that form the quadriceps muscle group. As mentioned earlier, the vastus medialis oblique (VMO) is one of these four muscles. The VMO is the section of muscle on the inside of the front of the thigh. The vastus lateralis (VL) runs down the outside part of the thigh. People with patellofemoral problems sometimes have problems in the timing between the VMO and the VL. The VL contracts first--before the VMO. This tends to pull the patella toward the outside of edge of the knee. The result is abnormal pressure on the articular surface of the patella. Diagnosis begins with a complete history of your knee problem followed by an examination of the knee, including the patella. X-rays may be ordered on the initial visit to your doctor. An X-ray can help determine if the patella is properly aligned in the femoral groove. Several X-rays taken with the knee bent at several different angles can help determine if the patella seems to be moving through the femoral groove in the correct alignment. The X-ray may show arthritis between the patella and thighbone, especially when the problems have been there for a while. All content provided by eORTHOPOD® is a registered trademark of Medical Multimedia Group, L.L.C.. Content is the sole property of Medical Multimedia Group, L.L.C.. and used herein by permission. All materials from eORTHOPOD® are the sole property of Medical Multimedia Group, L.L.C.. and are used herein by permission. eORTHOPOD® is a registered trademark of Medical Multimedia Group, L.L.C..